CG Vyapam Lecturer and Teacher Posts Vacancy 14580 Vacancies. Chhattisgarh Professional Examination Board (CGPEB) Has recently Invited Online Application Form for the post of Lecturer and Teacher Posts in Chhattisgarh state. Those candidates who are Interested and fullfil criteria they can apply form. Candidates should have passed educational qualification Higher Secondary, Diploma, B.El.Ed, Graduation, Batchler of Education, TET, Batchele of Arts or B.Sc.Ed or BA.Ed or B.Sc.Ed, Teacher Eligibility Test (TET). Candidates should read notification before Apply from. Minimum 21 years and maximum 35 years as on 01 Jan 2019. There will be age relaxation for SC, ST and OBC, OWD candiate as per government rules. The Selection of candiate for CG Vyapam lecture and Teacher Post depend on written exam/interview only. Candidates should log on to http://cgvyapam.choice.gov.in/. Now, click on “Apply Online” option when you enter there. Those who are new user Click on “Click here for candidates New Registration” option. Let’s Complete the Registration process and Click on “Submit” option. Again log in in registration number and password. Fill all the details there step by step upload photo, signature etc and finally submit it. Take print of you applied form for future use. 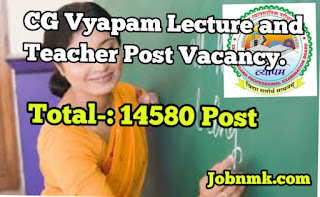 CG Vyapam Lecturer and Teacher Posts Vacancy 14580 Vacancies. We hope you got proper information about CG Vyapam Lecture and Teacher Post Vacancy.